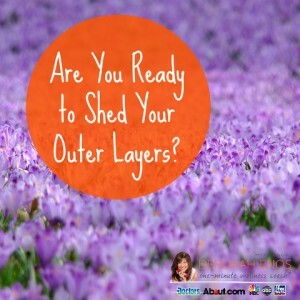 Are You Ready to Shed Your Outer Layers? We’ve made it through the winter, some of us by the skin of our teeth, but it’s not time to celebrate just yet. If you’re like me, you’ve taken comfort in the fact that you’ve been able to hide behind a big old winter coat for the past few months. Do you have a shape under there? No one knows – except, of course, for you! And you also know that shape is about to be revealed when you hang up your outer layers for the season. Are you ready? If you have strayed from your HEALTHY diet and exercise program in the colder months, now is the time to start easing yourself back into the program. Here are my best tips for working your way back into a healthy lifestyle gradually. Make one change, but make it lasting – Choose one bad habit to remove from your current routine. You probably already have something in mind, but I will give you some suggestions to get started. If you have been skipping breakfast, stop. If you have been adding sugar to your coffee everyday, stop. If you have been completely inactive, start a 10-minute exercise routine. Here’s what I’m working on: cutting back on my after work glass of wine. Some days, I want two glasses. When I have two glasses I usually end up grabbing a bag of high fat, salty chips (I buy them for the kids, wink). I then go to bed feeling stuffed and I don’t sleep well. My new routine? One night, a glass of wine, and the next night, a mocktail made with LaCroix no calorie sparking water and a snack size bag of Way Better Snacks Sweet Chili Tortilla Chips. Wish me luck! Do some mental spring cleaning It is natural to feel more depressed in the winter months. It’s cold, gray and gloomy, and you just want to curl up on the couch. But now is the time to set your sights on warmer weather. Make a list of fun things to do outdoors. Create a mental picture of the person you want to be this summer. Does she sit on the couch all day, or does she participate in 5k’s? Wondering where to start? Check out my fitbits board on Pinterest! Buy a new cookbook – Most people tend to cook a little heavier in the winter months, and it is difficult to break out of that habit when temps are still below freezing. But now that you are thinking about warm weather, it is a good time to lighten up your cooking too. Instead of cheesy potatoes as a side, how about a healthy quinoa salad?